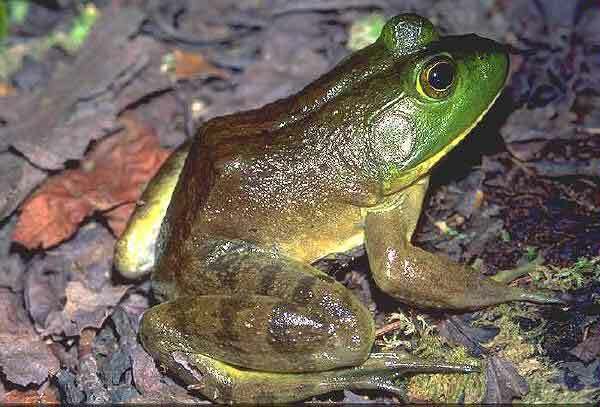 According to theBBC a deadly frog fungus native to North America has been found in wild populations of British frogs. The fungus – Batrachochytrium dendrobatidis, pictured above – is believed to have been introduced into Britain via american species (Rana catesbeiana) pictured below. The fungus was identified six years ago and is firmly established in parts of the Americas, Australia and Europe. 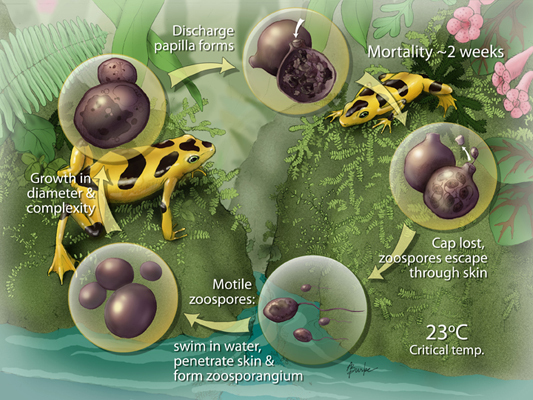 The disease it causes, chytridiomycosis, appears to kill amphibians by damaging their sensitive skins, blocking the passage of air and moisture. “I think there is great concern,” said Dr Richard Griffiths, an amphibian specialist at the University of Kent in Canterbury. “The fungus has turned up in many captive collections of exotic amphibians. And it can spread by motile zoospores in water,” he explained. 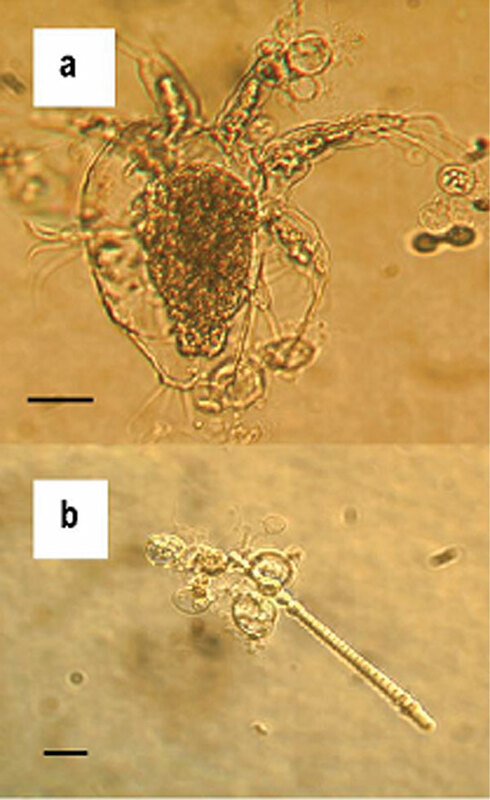 Below is a diagram of the fungus life cycle. The above is an Ozark Hellbender below is a picture of an Eastern Hellbender. Both species are native to Missouri and in the past 10-15 years have suffered serious population declines – estimates range from a 60-80 percent drop in numbers. Yue-wern Huang, an assistant professor of biological sciences at the University of Missouri at Rolla, says there seems to be a reproductive disruption among the salamanders. However, Huang says he’s unsure what is causing a disruption in the hellbender’s endocrine system, which regulates the secretion of hormones – although his theories include pollution, pesticides and people as possible causes. Stanley Trauth, a zoology professor at Arkansas State University in Jonesboro, showed pictures of hellbenders with open sores, tumors and missing limbs and eyes. He said that nine out of 10 animals found in the Spring River — mainly in northern Arkansas — this year had serious abnormalities. Max Nickerson of the University of Florida, who has worked with hellbenders for three decades, said his early research did not find nearly as many abnormalities. He called the new results baffling. Other possible causes of the decline include introduced species of trout which juvenile Ozark Hellbenders do not seem to recognize as predators.